Who are you hiding from Carrot? And what the HELL kind of chips are you pounding so subtly as you stare blankly into what can only be described as the abyss? Before indulging in these smokey, hickory treats, Carrot likes to give them a nice lick to see if they are too hot. Baton Rouge CT, Baton Rouge! 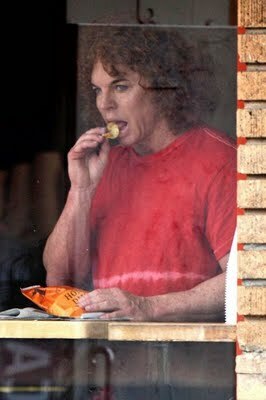 To be honest, I wouldn’t call “eating one chip” a “pounding,” but it’s a good opportunity to point out that Carrot Top is AWESOME. Carrot Top, you RULE. Keep On Pounding!